The big monthly data was obviously Friday's payrolls number. While the +80,000 headline number was still anemic, the internals fared considerably better, with jobs in the two prior months revised 100,000+ higher, aggregate hours increasing strongly, the manufacturing workweek increasing, and the U6 unemployment rate declining, among other things. Auto sales in October recorded another strong month. 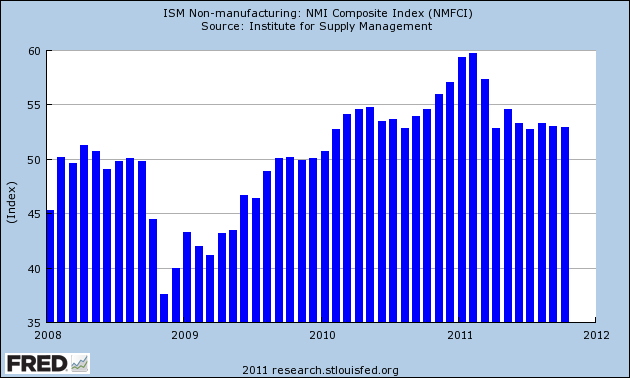 The ISM non-manufacturing index was fair. 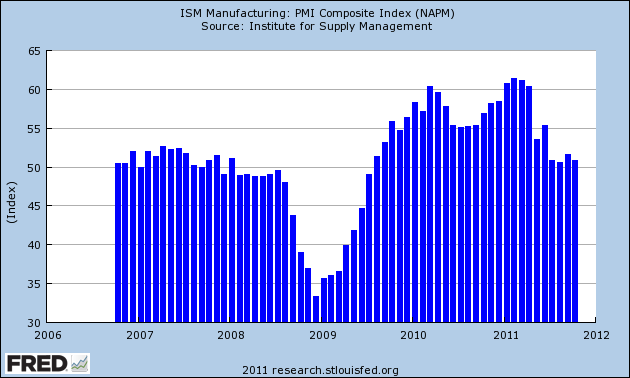 The only worrisome number was the ISM manufacturing index, just barely above contraction for the second month in a row. The high frequency weekly indicators had another generally good week with a few soft patches, continuing their substantial rebound from their brief contraction of late August and September. Last week I noted that gasoline usage had dropped precipitously YoY (nearly 10%). This week the dramatic YoY decline in usage continued, down -5.5% YoY, at 8518 M gallons vs. 9015 M a year ago. The 4 week moving average is off 4%. This may be evidence that consumers have permanently altered their gasoline usage habits towards more conservation (h/t commenters). Oil closed at $94.50 a barrel on Friday. This is at its recession-trigger level. Gas at the pump declined $.01 to $3.45 a gallon. Measured this way, we probably are still about $.20 above the 2008 recession trigger level. Total rail traffic has improved substantially in the last month after having turned negative for 6 of 12 weeks during the summer. The American Association of Railroads reported that total carloads increased 5.0% YoY, up about 26,100 carloads YoY to 551,700. Intermodal traffic (a proxy for imports and exports) was up 10,800 carloads, or 4.6% YoY. The remaining baseline plus cyclical traffic increased 15,200 carloads or 5.2% YoY. The weekly jobs data continued to improve. The BLS reported that Initial jobless claims fell 5,000 to 397,000. The four week average declined to 404,500. The four week average remains close to its best reading in over 3 years. The American Staffing Association Index remained at 91 last week. In the last couple of months, this series has resumed its upward trajectory, but remains lower YoY. Tax withholding improved for the second week. Adjusting +1.07% due to the 2011 tax compromise, the Daily Treasury Statement showed that for the 20 days making up the reporting month of October, $139.1 B was collected vs. $131.3 a year ago, a gain of $7.8 B or 5.9%. Weekly BAA commercial bond rates decreased .05% to 5.36%. Contrarily, yields on 10 year treasury bonds rose .08% to 2.28%. This is the fourth week in a row of decreasing spreads between the two rates, a good sign, as is the decreased fear of deflation shown in treasuries. Retail same store sales remained positive. The ICSC reported that same store sales for the week of October 29 increased 3.0% YoY, and 0.7% week over week. Shoppertrak reported that YoY sales rose 4.7% YoY and were down -2.2% week over week. Through thick and thin, the consumer has not rolled over this year. Housing was mixed. The Mortgage Bankers' Association reported that seasonally adjusted purchase mortgage applications increased 1.8% last week. On a YoY basis, purchase applications were down -2.1%. This is back in the range that purchases mortgage applications have had been in for the 15 months beofre September. Refinancing decreased 0.2% w/w. Refinancing has been very volatile and affected by small changes in interest rates. Meanwhile, YoY weekly median asking house prices from 54 metropolitan areas at Housing Tracker showed that the asking prices declined -1.1% YoY. The areas with YoY% increases in price decreased by two to 15. The areas with double-digit YoY% declines increased by one (Orange County, CA) to 3. This was the first relatively weak report in months. Finally, as to money supply, M1 declined again last week, down -1.2%.. It remains up (barely) 0.2% m/m, and 20.0% YoY, so Real M1 was up 16.1%. M2 also declined, down -0.4% w/w. It remained up 0.4% m/m, and 9.9% YoY, so Real M2 was up 6.0%. The YoY increase in both M1 and M2 remains near historic high levels. It will be interesting to see what continues to happen to these two series in the next several weeks, as a gauge of confidence as to whether the Euro situation is truly on its way to being solved. With the exception of weekly money supply and housing prices, all the weekly reports were positive, some strongly so, this week. It is worth noting that the anomaly of terrible consumer confidence and positive consumer spending continues. For now, the indicators show an economy continuing its expansion. "The PMI registered 50.8 percent, a decrease of 0.8 percentage point from September's reading of 51.6 percent, indicating expansion in the manufacturing sector for the 27th consecutive month. The New Orders Index increased 2.8 percentage points from September to 52.4 percent, indicating a return to growth after three months of contraction. The Prices Index, at 41 percent, dropped 15 percentage points, and is below the 50 percent mark for the first time since May 2009 when it registered 43.5 percent. Inventories decreased to 46.7 percent, which is 5.3 percentage points below the September reading of 52 percent. Comments from respondents are mixed, indicating positive relief from raw materials pricing and continuing strength in a few industries, but there is also more concern and caution about growth in this uncertain economy." While the index took a large dive earlier this year, it has remained positive, although just slightly so for the entire year. 3.) Demand is dropping, but not crashing. 3.) Employment was at 53.5 -- also positive. "The NMI registered 52.9 percent in October, 0.1 percentage point lower than the 53 percent registered in September, and indicating continued growth at a slightly slower rate in the non-manufacturing sector. The Non-Manufacturing Business Activity Index decreased 3.3 percentage points to 53.8 percent, reflecting growth for the 27th consecutive month. The New Orders Index decreased by 4.1 percentage points to 52.4 percent. The Employment Index increased 4.6 percentage points to 53.3 percent, indicating growth in employment after one month of contraction. The Prices Index decreased 4.8 percentage points to 57.1 percent, indicating prices increased at a slower rate in October when compared to September. According to the NMI, eight non-manufacturing industries reported growth in October. Even though there is month-over-month growth in the Employment Index, respondents are still expressing concern over available labor resources and job growth. The continued strong push for inventory reduction by supply management professionals has resulted in contraction in the Inventories Index for the first time in eight months. Respondents' comments are mixed and reflect concern about future business conditions." The index has been in the same place for the last seven months. The overall tenor of the above comments is one of continued activity with a slightly negative bias. There is no indication that businesses are growing strongly, but there is also no indication that businesses are contracting either. There is caution, but but no collapse. The BLS just released the Employment Situation Summary for October 2011 and while the headline Establishment Survey number of 80,000 was a bit below expectations, the internals of the report are much better than the headline would have us believe. Let us turn to the Household Survey for the yeoman's work of this report, as this survey shows that the unemployment rate (U-3) declined by .1 to 9.0%. Now, while that isn't a big decline, it at least was caused by both an increase in the number of employed (up 277,000) and a decrease in those unemployed (down 95,000). This also occurred while the labor force expanded by nearly 200,000 people and the "not in the labor force" number barely increased (up about 20,000, which is good because retirements are adding to this number every month). In other words, jobs were created, the unemployed got some of them, and more people looked for work this month than last. Also in this report, we saw U-6 decline by .3 to 16.2%, which is likely in part related to the decline (of over 300k) of people employed "part-time for economic reasons". And since unemployment didn't increase, we can reasonably assume that many of these people may have indeed had their hours increased as opposed to having received a layoff notice. Finally, in the good news department were the positive revisions to prior months, with August going up from 57,000 to 104,000 (remember all those headlines about 0 jobs that month) and September going up from plus 103k to plus 158k. In the bad news department (although to some I guess this is good news), government jobs declined by 24k in the Establishment Survey in October, with the bulk of those coming at the state level. Overall, while this report isn't exactly spectacular, considering where we have been and all the talk of a double dip recession it is actually reasonably decent. Couple that with the much improved internals of the report (specifically the Household Survey), the recent GDP numbers, and the recent declines in initial claims, and we have some reason to be hopeful about the remaining two months in the year. Yesterday, I noted it was possible to look at the 10 day, 5-minute chart as a forming head and shoulders pattern. Yesterday's rally eliminated that possibility, with the market now in a slight uptrend. And while we've seen some strength in the Treasury market, the reality is it too is trading around the 10, 20 and 50 day EMA. While gold caught a small bid over the last few days -- and while it still remains above it's long-term trend line -- there is a lack of volume indicating a lack of interest. Overall, the daily moves this week can be seen as part of a larger consolidation move in all the markets. The equity markets rallied strongly a starting a few weeks ago, and now traders are taking profits and reassessing their positions. The treasury market sold off, but now, again, traders are looking at the recent price action in terms of the larger picture to see what might come next. One reason we have so few ideas about job creation is that up until recently, the U.S. economy had been growing so well for so long that few economists spent much time studying it. (They’re trying to make up for it now. See the chart on the next page.) With no new theories, Democrats dusted off the big idea from the Great Depression, John Maynard Keynes’s view that government can create jobs by spending a lot of money. The stimulus, however, has to be borrowed, and it has to be really, truly huge — probably something like $1.5 or $2 trillion — to fill the gap between where the economy is and where it would be if everyone was spending at pre-recession levels. The goal is to goad consumers into spending again. And President Obama’s jettisoned $400 billion jobs package, hard-core Keynesians argue, is nowhere near what it would take to persuade them. Many Republicans follow the more fiscally conservative University of Chicago School, which argues that Keynesian stimulus can’t heal a sick economy — only time can. Chicagoans believe that economies can only truly recover on their own and that policy interventions only slow the recovery. It’s a puzzle of modern politics that Republicans have had electoral success with a policy that fundamentally asserts there is nothing the government can do to create jobs any time soon. This is actually a pretty good explanation of the big policy differences between the two camps. I would also add that there is a big difference in the way both camps perceive government, with the Keynseans believing government can do some good things whereas the Chicago school seems to be hostile to the government in general. The 4 week moving average is now off nearly 5%. 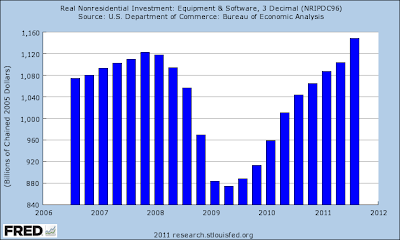 In fact, the graph doesn't really do the downturn justice. By compariing the EIA gasoline demand weekly raw data, we can see that demand actually held up quite well (as in, within 1 or 2% YoY compared with 2010) through June. As gasoline prices were near $4 a gallon in April, and up about $1.50 a gallon, or +40% YoY, it made sense that consumers were cutting back. But the decline in usage intensified in July, and now at -5% YoY is the worst since the mid-September through mid-October 2008 period when we were being told that we faced Economic Armageddon. And like that decline, this one is occurring despite an ongoing decline in gasoline prices (down about $0.50 since April). 1. demand destruction. But if so, why is consumer spending, as measured by the Gallup daily survey, holding up so well? 2. energy efficiency. But have we really bought so many hybrid vehicles to make that big a difference? 3. the weather. OK, we did have a strange Nor'easter that pummeled the northern and western suburbs of the Megalopolis, but that was one day only. 4. random stuff just happens. Always a possibility, but this seems unlikely given at least three weeks in a row of awful YoY comparisons. I don't have any single great explanation. But something is clearly going on as far as I can tell, and hopefully some other bloggers will take a serious look for which explanation is the most important. The IWMS (The Russell 2000) has broken the shorter uptrend. Yesterday's rally took prices right to the trend line hitting upside resistance. The SPYs may be forming a head and shoulders formation, which would mean lower prices are in the cards. Typically, I like more defined head and shoulder patterns, but the general price moves are head and shoulder"ish." In contrast to the SPYs and IWMs, the DIAs are more bullish. While prices did break a short-term trend line, they also fell to technical support and have moved higher. The equity markets are in a difficult place. While the US data is getting a bit better -- and while the fear of a double dip recession have faded -- Greece's announcement on Monday that it would put austerity to a referendum qualifies as a "one step back" news development, literally sucking the wind out of the bulls' sales. In contrast to equities, we have the treasury market, which was inter-twined with the EMAs for a week and a half, before gapping lower and then moving sharply higher in reaction to the Greek announcement. While we saw a good volume spike yesterday, that has not accompanied by a price increase, meaning traders are at least pausing from the current rally. The 10-day 5-minute chart shows that action in more detail; we can see that over the last two day prices have consolidated in a narrow range (103.8 - 104.6), digesting the quick move higher. As I noted yesterday, the Greek announcement was a fundamental game changer. The charts show the markets are tying to digest the news. Are inflation pressures here to stay? With that adjustment, it looks like the trend is that the fall in prices, while not over, is probably within 1% of its bottom. It is important to note that YoY data will not turn positive (or negative) until months after the bottom (or top). For example, nonfarm payrolls bottomed in February 2010. The YoY number did not turn positive until 5 months later, in July. Since Housing Tracker's numbers aren't seasonally adjusted, we have to go with the YoY result, but it is a virtual certainty that at some point in the last 12 months, an actual bottom has already been established. Why do I track housing prices? In addition to the fact that conventional wisdom, while solidly entrenched, appears to be wrong, it makes a huge difference as to whether any further declines in the housing market are nominal, or only occur after adjusting for inflation (Shiller himself believes another 15% or more decline in real terms is likely, and I do not have any reason to disagree with that). Sellers who bought a house for $250,000 10 years ago, saw the value increase to $500,000 and then fall all the way back to $250,000 in nominal terms can, even if inflation continues to erode the value of their house by 20% in real terms, still sell their house without bringing cash to the table. On the other hand, sellers whose further depreciation of 20% is nominal (to $200,000), must bring $50,000 to the closing table. You can see that the two scenarios make an enormous difference in the ability of sellers to move, and the likely increase (or not) of foreclosures. Another 4 years of similar real declines will get us to Shiller's 15%+ number -- without any further nominal decline in prices at all. Last week, everything looked pretty good. US GDP came in at 2.5% -- not great, but certainly not terrible. And the leaders in Europe actually came up with the framework of a plan to deal with the Greek situation. Frankly, I breathed a sign of relief, and thought, "this looks like the end of the turmoil." Little did I know the Greek leader would announce he would put austerity measures to a public vote. Now, I understand what he's getting at -- he wants the tough measures to meet with public approval so he can move forward. Theoretically, this will give him the mandate to continue making the tough cuts that Greece, frankly, needs to make. But what he didn't consider (or maybe he did and simply looked the other way) was this: "what are the effects if the vote fails, and what will happen to the financial markets in the interim period?" The answer is pretty damn ugly -- or, at least more of the same high volatility trading we've been seeing for the last few months. And more importantly, if the vote fails, Greece has probably guaranteed a very messy default which threatens a large number of financial institutions. In short, failure of the vote would really hurt the markets and the macro-economic environment in an incredibly negative manner right at a time that we really don't need it. In short, this is a bone-headed move that has little upside and massive downside. Thanks. No, really, thanks for this. So much for the risk on trade. After Greece announced it would put austerity to a national vote, the risk on trade died quickly and painfully. The SPYs dropped sharply, gapping lower, moving through the 10, 20 and 200 day EMA. Prices rallied to the 200 day EMA, but fell back. Also note the increased volume spike. In contrast, we saw the Treasury market gap higher on strong volume. About the only good thing on this chart from a "risk on" perspective is that prices printed a very narrow candle which many traders consider a reversal pattern. Finally, we see the dollar has rallied from the 21.20 are to the 200 day EMA, moving through all the shorter EMAs (10, 20 and 50 day) to settle right around the 200 day EMA. So -- what does all this mean, really? First, two days of technical action is really pretty meaningless in the bigger, longer run picture. However, the Greek announcement is a huge game changer, which I'll explain in the next post. The bottom line is the fundamental backdrop against which we look at the technical market indicators (or through it), has changed in a significant way -- and not in a good way. Should food and energy prices take a larger role in Fed's inflation calculations? Above is a chart from the St. Louis Fed that shows total investment in equipment and software. If businesses were really concerned about uncertainty, we wouldn't be seeing this level of investment activity - which is actually quite strong. The players came together in 2009, and it was a strong coalition — the U.S. Chamber of Commerce, labor groups, cities, states and county groups banded together. Truckers also joined with the manufacturers whose goods they transport. But it wasn’t enough. Pro-business Republicans ignored the Chamber’s advice. Democrats didn’t do what unions wanted. The White House, worried about the middle class in a bad economy, didn’t want to further burden working families. “We are not going to raise the gas tax. I will be emphatic on that — we can’t,” Transportation Secretary Ray LaHood told Congress in 2009. Former Sen. George Voinovich (R-Ohio) said President Barack Obama missed his chance to increase the gas tax and pass a robust highway and transit bill. “The president is talking about wanting to do something — but he missed the boat,” Voinovich said. Voinovich is far from alone in his thinking. A number of transportation stakeholders were optimistic — in hindsight, overly so — about the prospects for strong federal funding of infrastructure. What they could have done is fund the spending with a short-term increase in borrowing (remember, interest rates have been incredibly low for some time) and then tied a tax increase to an economic marker such as, "when GDP grows at over 3% for a period of X quarters, the gas tax will increase by Y and the funds will be specifically targeted to infrastructure." But, that just wasn't going to happen. Yesterday, I commented that this week would be a good time for the market to pull back from its latest rally in order to catch its breath. That's what happened yesterday. On the 10 day, 5-minut chart, prices are still in an upward sloping patter just barely. Yesterday, prices gapped lower at the open, traded sideways for most of the session, and then moved lower, selling off at the end of the day. This is generally a bad sign, as it indicates traders don't want to hold positions overnight for fear of negative events. On the daily chart, yesterday's sell-off took prices down to the trend line, but on weak volume. However, prices are right at the 10 day EMA and still have technical support from the 200 day EMA. The big move came in the Treasury market, where the long-end of the curve rallied strongly on a slight uptick in volume. Yesterday's bar gapped higher at the open and closed at its high -- an extremely bullish development. From the equity/bond perspective, yesterday was one day of trading, so reading too much into the events should be avoided. However, it's also important that a lot of technical change did occur in a single trading period, as it shows that traders have an itchy trigger finger. After peaking earlier this year, gold sold-off and consolidated along the long term trend line. Over the last few days it ha spiked higher. The 3 month charts shows that prices and the EMAs are in a tight range, indicating indecision on the part of traders. Also note the lack of volume, showing diminishing enthusiasm. Gold is in a holding pattern right now. The above chart simply shows last quarter GDP growth rate and the component parts of the GDP equation that contributed to growth. 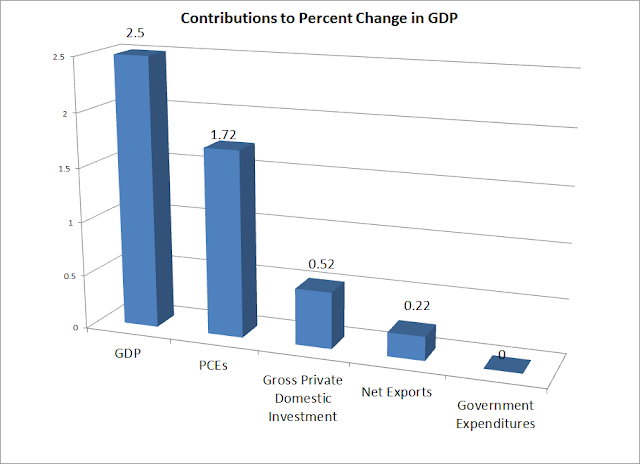 PCEs were strong as was gross private domestic investment. Also consider that inventory adjustments subtracted a full percentage point from the above total; had that number printed a "0" we would have seen growth of 3.5%. Right now the Fed is in a policy quandary: rates are already as low as they can go, yet unemployment is still about 9%. While I believe that food inflation is a bigger issue than the Fed seems to, the Fed does not appear to be concerned about inflationary pressures. Yet, the economy is still stuck in second gear, so the Fed governors are looking for some type of new policy idea. Hence, we're seeing trial balloons such as the one above being floated. Let me note several aspects to this policy conditionality. As I just said, I subscribe to a 2 percent target for inflation over the long run. However, given how badly we are doing on our employment mandate, we need to be willing to take a risk on inflation going modestly higher in the short run if that is a consequence of polices aimed at lowering unemployment. With regard to the inflation marker, we have already experienced unduly low inflation of 1 percent; so against an objective of 2 percent, 3 percent inflation would be an equivalent policy loss to what we have already experienced. On the unemployment marker, a decline to 7 percent would be quite helpful. However, weighed against a conservative estimate for the natural rate of unemployment of 6 percent, it still represents a substantial policy loss. Indeed, weighed against a less conservative long-run estimate of the natural rate, it is a larger policy loss than that from 3 percent inflation. Accordingly, these triggers remain quite conservatively tilted in favor of disciplined inflation performance over enhanced growth and employment, and it would not be unreasonable to consider an even lower unemployment threshold before starting policy tightening. Here, the Fed president is laying out how he arrived at carious targets. 7% unemployment would still be a "policy loss" even considering that the new natural rate of unemployment (the lowest possible level unemployment could go) is higher. In addition, the 3% inflation rate would still be a policy loss, even considering we've seen fairly tame inflation numbers over the last few years (the economy was on the verge of massive deflation during the recession). Agree or disagree, it's good that he's laid out his thinking on the subject. Here, the Fed president is acknowledging the current economic environment requires extraordinary measures, or more outside the box thinking. Hence, changing the Fed's goals -- or telegraphing explicit policy goals -- is not inconsistent with economic expectations that would occur in a more "normal" economic environment. Overall, this is a very interesting plan. This week I wanted to start with copper. Over the last month it has formed a double bottom on strong volume and has now reversed from that into a counter-rally. Prices are now above the 50 day EMA and have ample space to run. This is a very encouraging chart, especially considering copper's overall economic importance. On the 5-minute chart, notice the SPYs price action can be broken down into several sub areas, with the first one between 119 and 123, the second between 122.5 and 125.5 and the third between 126.5 and 129.5. This is a good, healthy development as it allows prices to advance and then "catch their breath." On the daily chart we see prices are still in a strong upswing. Prices are above the 200 day EMA and all the shorter EMAs are moving higher. The 10 day EMA has crossed over the 200 and the 20 day EMA has crossed over the 50. As noted in the preceding chart, prices are advancing and then halting their upward move. Ideally, we'd like to see prices move a bit lower right now, finding support at the 10 day EMA. This would allow some traders to take some profits and allow others to get in a at a solid entrance point. On the flip side of the risk spectrum are Treasuries, which are in a clear sell-off. The long-end of the market is now below the 50 day EMA, with the 10 and 20 day EMAs moving lower. Ideally, we'd like to see a small rally to force a small amount of short covering and let other shorts enter the market. I would expect this week to be composed of "breathers," with equities moving a bit lower and Treasuries moving a bit higher. But both of these moves would be considered counter-rallies to the overall general trend, which is definitely risk on.